Protesters against CETA. Gregorio Borgia/PAimages. All rights reserved. As the world gets used to the idea of a Trump presidency in the US and all the implications for minorities, women, values, fact-based policy and the basic tenets of an open and just society, Wallonia’s rearguard action on the EU’s trade deal with Canada feels like old news. The CETA agreement could be seen as the last gasp of liberal internationalism or a superficial act of trade diplomacy between partners who have yet to wake up to the reality of ‘reasoned protectionism’. 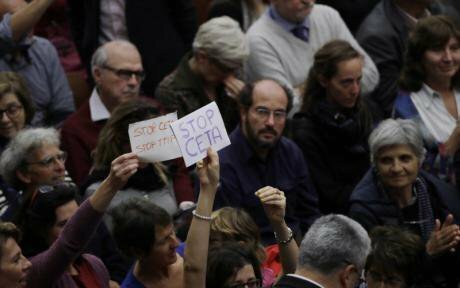 Rather, CETA now becomes more, not less significant. It is a transatlantic confirmation that open trade, shared values and similar social and environmental standards can be maintained despite elements of rejectionism on both sides. It is also useful to note how close the EU came to scoring an own goal. Two populist tidal waves – Brexit and Trump – will preoccupy much of Europe and North America, and beyond, over the coming years. In the face of such enormous geopolitical shifts, what can the defiant stand of a minority of Belgians tell us about anything? The devil is in the details. First, those characterizing the temporary blocking of the EU’s Comprehensive Economic and Trade Agreement with Canada as another populist coup are simplifying a complex reality into one catch-all phenomenon – anti-globalization – that does not help anyone. Second, there is general consensus that the old fault line of left versus right is outdated. From The Economist to former European Council President Herman Van Rompuy, all agree on what Tony Blair highlighted almost a decade ago, that the modern choice, rather than between left and right, is between open or closed societies. President Elect Trump and former UKIP leader Farage would now claim that the new fault line is between citizens and the establishment. This is not the full picture. As the case of Wallonia illustrates, it is now the very idea of ‘openness’ that is a critical battleground. A closer look at the dynamics of CETA negotiations shows why. CETA has mixed agreement status because it covers policy areas which are under member state and EU control. For the adoption and signing of CETA on 30 October the 28 member states in the Council needed to all give their signatures. Belgium could only do so with the approval from their regional and community entities. The Flemish agreed. Wallonia, followed by two others, rejected the deal (again). Paul Magnette, the Minister-President of Wallonia, was not using populist rhetoric or fact-free propaganda to whip up support from a disgruntled majority through a referendum. He was expressing a democratic mandate and constitutional duty to represent his constituents. In an unfortunate illustration of the divide between elites and citizens, those constituents have since been branded as anti-globalizers and a "micro-region" ruled by communists. Yes, CETA promises to connect roughly 535 million citizens, and has been held up by 4.5 million Francophone Belgians. But that dissenting minority is roughly the size of the population of the Republic of Ireland and more populous than eight EU member states. Across France, Germany, and elsewhere, a much higher number of citizens protested against the deal. Some analysts are right that the core problem here sounds like the populist war cry of ‘take back control’. But they are wrong to suggest this is not based on real and relevant issues. At the core of the argument against CETA is the Investor-State Dispute Settlement mechanism, or ISDS. It will enable companies to take countries to court for changing their laws, as they often do under existing investment agreements. Initially, ISDS was an issue within the US version of CETA, the Trans-Atlantic Investment and Partnership agreement (TTIP). The European Commission initiated a consultation on ISDS in TTIP (but not on CETA) after mass mobilization against the mechanism. After the consultation closed, the Commission then announced that CETA would go ahead – with its ISDS clause intact. This potential miss-step was temporarily fixed by asking the Canadians to accept a reformed version of ISDS, the new Investment Court System (ICS), in their agreement. But the reform of ISDS into ICS was too little, too late. The Commission did not recognize that re-bottling as ICS was not enough to satisfy those that challenged the whole concept of investor-state settlement that gave multinationals undue influence over ‘sovereign’ policy decisions. In the Commission’s own account, these views are shared “by most of the trade unions”, a “majority of NGOs”, and many other organisations, including “consumer organisations.” The report then notes that in contrast “a large majority of business associations and the majority of large companies strongly support investment protection and ISDS in TTIP” – that is to say a large majority of the replies from 60 companies, 15 consultancy firms, 66 trade associations, and 7 law firms. The report claims that all submissions were “taken into account as valid contributions”, but the insinuation, made more explicit in private, was that collective submissions were less valid than those that were clearly individual to an organization or person. By maintaining a version of ISDS, the Commission gave notice that the majority of 148 submissions trumped the collective submissions of 145,000. As Magnette went to great lengths to explain, those that are anti-CETA are not against the benefits of trade, they are against deals done behind closed doors that will benefit executives, lawyers and multinationals but not workers or consumers. It is a principled argument but it is also based on fact. If you were one of the 145,000 who went to a platform to respond to the consultation, the idea of ‘openness’ – represented here by an open trade deal and an open consultation – has been captured by a closed establishment. This explains why the nominally positive suffix of ‘open’ is questionable if it remains abstract, or selective, or if the benefits of ‘openness’ are only received by others. If it becomes associated only with someone else, the establishment, or some incarnation of ‘the other’, then it can be seen as a threat or a tool of exploitation. This is dangerous territory, where populisms flourish. If the very idea of ‘open’ is captured and used to categorize critics against certain policies as ‘closed’, it becomes a deliberate demonization of dissent, a tool of a perceived elite establishment to reject concerns that go against their consensus. For those who believe that open societies are worth protecting and promoting in Europe and beyond, there is a lesson and a warning from the Walloons: first, we have to be much better at qualifying what we mean by ‘open’; and then we have to clarify who benefits. Open trade, open borders, open data, open government are not enough in themselves. These elements of openness are tools towards goals, not goals in themselves. If their objectives are not clear, then they are open for populist manipulation, dissent and popular rejection. The scope of what ‘openness’ entails – from an independent media, to access to medicines, to public registers for shell companies; from access to legal aid, to participatory democracy, to the inclusion of minorities – reveal its strength: plurality. But each strand, each tool and each objective cannot be taken for granted. Openness needs to be better defined and more broadly championed. Rather than generalizing on the intentions of 3.5 million Walloons, and labelling them as anti-globalizers, we should thank them for reminding us that principles and pragmatism are not mutually exclusive. CETA was a lucky escape for the EU. The exasperation of the Canadian leadership, the final Belgian stand on the court mechanism, the scramble towards a concession that allows each EU member state to decide whether they will accept the ICS, could all have been avoided. The Commission’s consultation should have acted as a bellwether rather than an anomaly. Participatory policymaking cannot work if the mechanisms for participation fail, or worse, the messages delivered are ignored. An ‘open’ trade deal with Canada almost didn’t happen because those that were its champions were unable to defend their assumptions about who would benefit. There are still a few hurdles to cross. The European Parliament needs to give its consent and then ratification is still required by each member state. But the irony is that CETA, so controversial two short weeks ago, may end up being less significant as a trade agreement and more as a transatlantic lifeline for openness that stands against the tide.